For the hollandaise, boil down white wine, some of the white wine vinegar, fresh tarragon, peppercorns, and mustard seeds in a small saucepan until half the liquid has evaporated. Pass liquid through a sieve and whisk with the egg yolks in a heat-resistant bowl over a bain-marie until the mixture has slightly thickened. Now, gradually fold in warm, melted butter into the foamy mass, while beating constantly. Season with salt to taste and set aside. Heat up some water in a large sauce pan until it simmers. Add rest of white wine vinegar and poach eggs in the water for approx. 2 – 3 min. Drain on a plate lined with paper towels. In the meantime, fry ham in frying pan on both sides for approx. 1 – 2 min. until crispy. 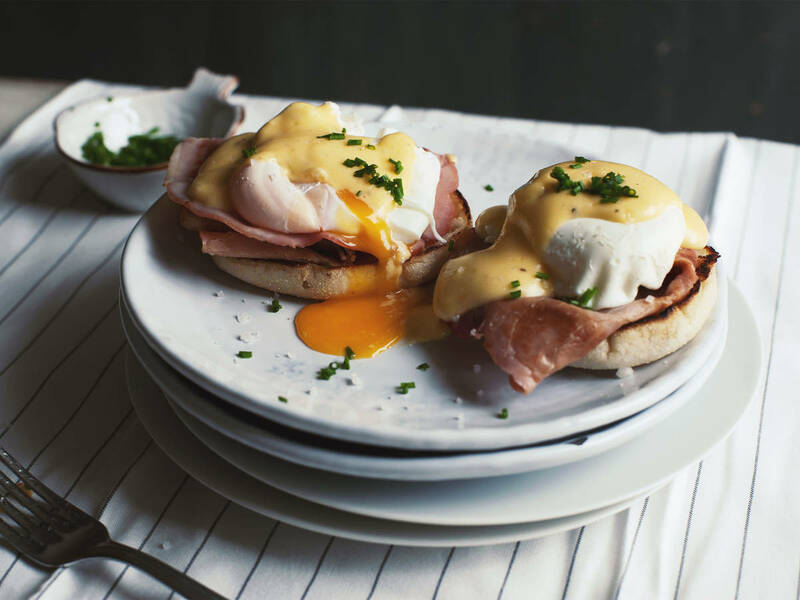 Halve English muffins, top each with a slice of ham and a poached egg. Sprinkle with some salt and warm hollandaise sauce.